It was my routine to be a computer operator and observer when doing theodolite tracking. 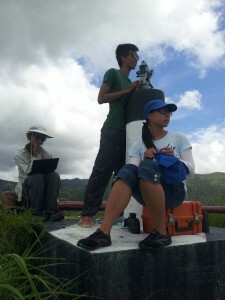 But last Wednesday, I was so happy to be given a chance to practice operating theodolite. I knew that it was hard to focus objects within the extremely small field of vision of eyepiece; however, it was my first time to experience how it actually is. As the traffic was not heavy in Tai O, I focused on tracking those tour boats travelling in inshore area of Tai O. 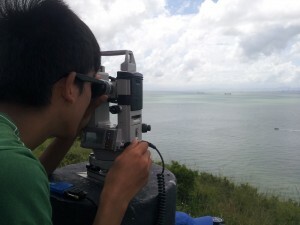 Every time I wanted to focus the boats, I spent a long time on adjusting the eyepiece. Even though I had found them, I still needed to pay much effort in focusing the right position of the boats. And sadly, I was not able to do it very accurately. The longer time spent and the inaccuracy of fixing positions are the most obvious differences between my work and the masterpiece of those experienced theodolite operators, Vincent, Perry and Leo. I really appreciate their skills in operating theodolite after the trial. This experience was really a precious one in the internship programme. 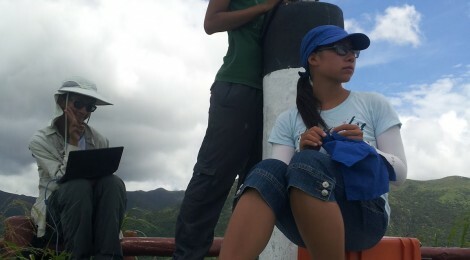 But it was imperfect that I was not lucky enough to track dolphins as they disappeared just before I started tracking. Hopefully I could have another chance to practice it again on the remaining days that I stay here, though it seems to be impossible.